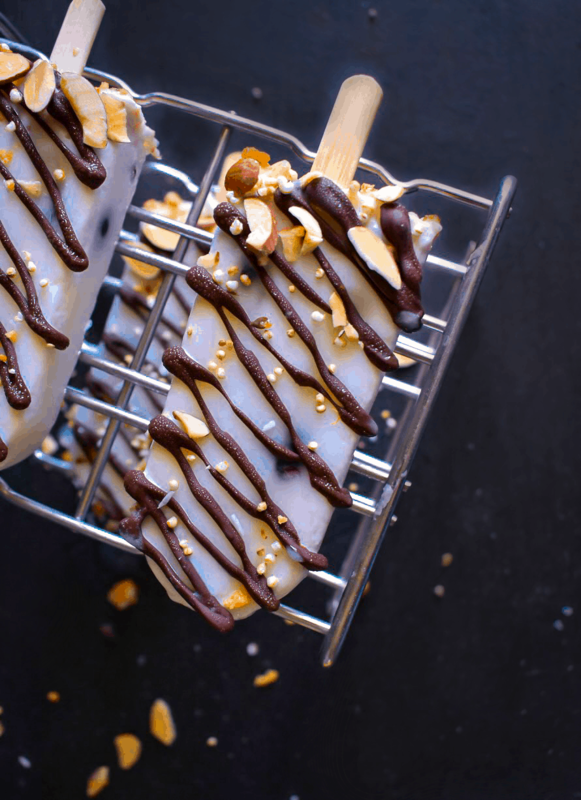 Chocolate Yogurt Breakfast Popsicles: absolutely delicious and healthy popsicles that make ‘eating dessert for breakfast’ dreams come true. 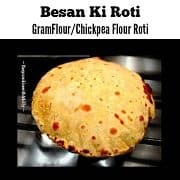 What’s even better, they can be made ahead of time and work as a great snack or to-go meal too. 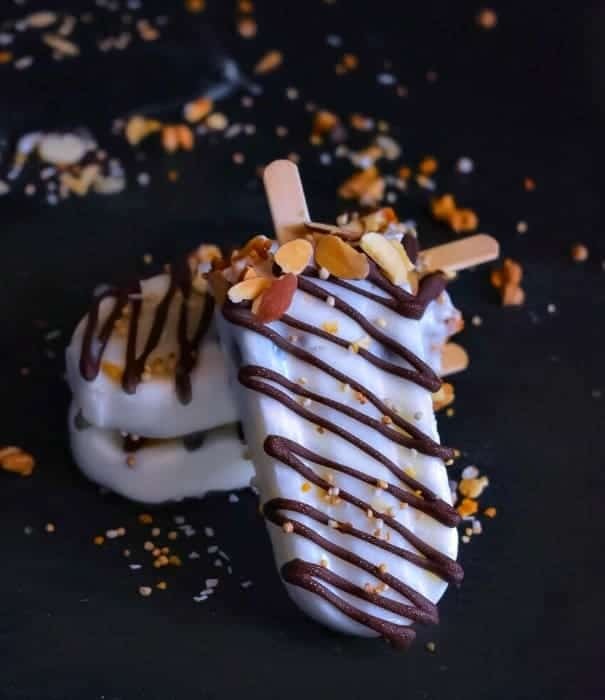 There is nothing more delicious than waking up to these gorgeous looking, creamy and Super Easy Chocolate Yogurt Breakfast Popsicles cause once you try them, you’ll be absolutely in love!. They have everything you need in a well-balanced breakfast and are gently flavored by Nielsen-Massey Pure Chocolate Extract (Seriously, Chocolate for breakfast is like dream come true for many of us). As you all know, I’m a firm believer of ‘eating breakfast’ no matter how hectic your day is or even if you’re trying to maintain a certain diet. I’ve noticed, that the day I used to skip breakfast, I ended up eating more. I would reach a point when I would become super hungry and then stuff myself with whatever comes my way! So, I finally pledged to have breakfast every single day and to make it quick, I’ve even started to plan them ahead of time. 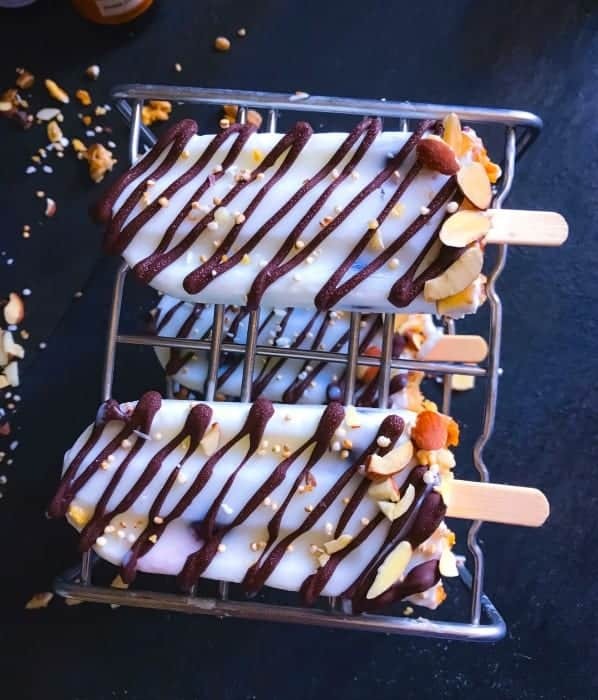 Like these Chocolate Yogurt Breakfast Popsicles which I usually make once and eat for next couple of days. 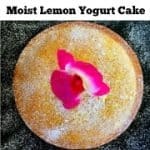 Now, I’ve been a huge fan of Neilson Massey pure extracts especially Rose, Almond, and Vanilla and have been using them for ages in my baked and drinks recipes. But I recently got to try the (Lemon, Peppermint, Chocolate) extracts and decided to use them in my breakfast recipes. I’m starting with the Pure Chocolate Extract and using it in these ‘Breakfast Popsicles’. 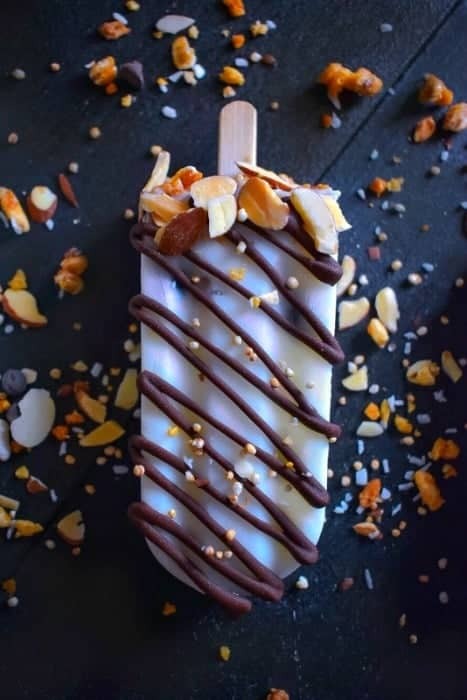 When I served them to everyone at home, they were surprised to find a delicious-faint chocolate flavor which works perfectly with all the other ingredients in the popsicles. I also added a few drops of extract in the chocolate drizzle on top to make it extra yummmmm ! The pure chocolate extract is made from the finest cacao beans and can be added to a wide range of dishes, including beverages, desserts, sauces, chilis and other spicy foods. The other ingredients in the popsicles are yogurt (dairy/non-dairy – any would do), granola, berries, nuts, etc. I’m using my homemade Stovetop Coconut Granola (Glutenfree-Vegan) granola in this recipe, however, you can use any granola of choice. 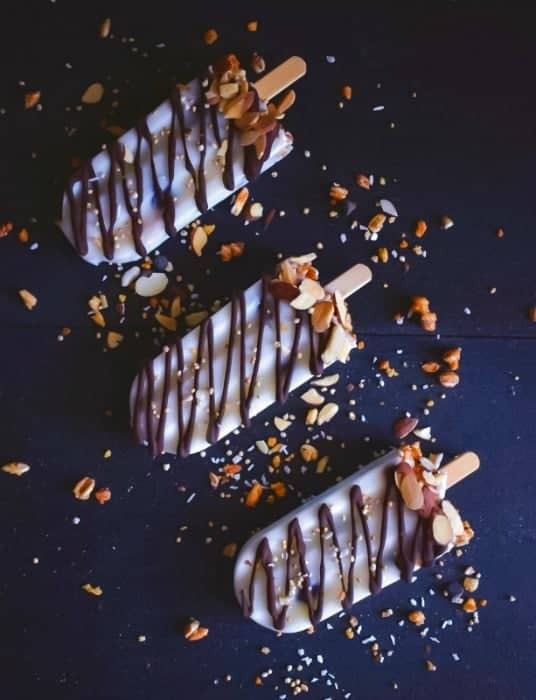 Once, the popsicles were ready, I just sprinkled some slivered almonds and roasted quinoa seeds to make it even more gorgeous and healthy. * They are a family owned company and all their products are natural, certified gluten-free, certified Kosher, allergen-free and GMO-Free. 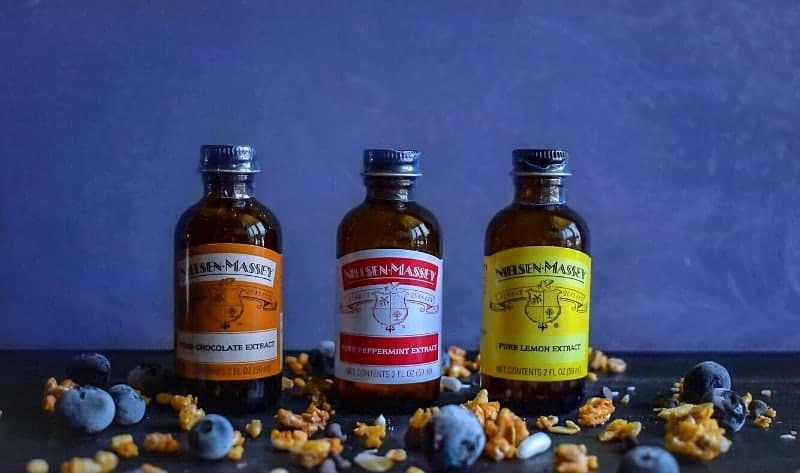 * To give us that all-natural pure flavors, they start with premium ingredients sourced from around the world and uses a proprietary process to gently extract the delicate flavor without losing any of the sweetness or richness of the original ingredient. 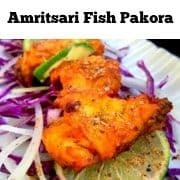 * Pure flavors offer convenience, quality, and consistency. Store in an airtight container at room temperature and away from direct heat and sunlight. 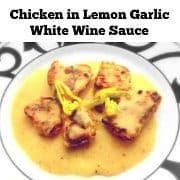 Don’t put them in the refrigerator or freezer, as refrigeration or freezing will speed up the natural separation of the ingredient from the liquid base. Once, these Chocolate Yogurt Breakfast Popsicles are ready, I usually cling wrap each bar or put them in individual ziploc bags in the freezer. That way, they are easy for us to use and makes a great to-go breakfast too. I’ve even used them for my mid-afternoon snacks at times when my energy hits the lowest point and I’m in need of that ‘Pick Me Up’ food! In a large bowl, whisk together yogurt, milk, protein powder, maple syrup and pure chocolate extract. Take a popsicle mold, pour the whisked yogurt mix half way through and then add 3-4 blueberries. Fill rest of the mold with yogurt mix leaving some space on top to add the granola. Top with granola and press gently to make it stick to the yogurt. Similarly, fill all the popsicle molds and freeze for 4-5 hours or overnight. Add coconut oil and chocolate chip in a microwave safe bowl and microwave for 20 seconds. Tae out the bowl, whisk the mixture and microwave for another 10 seconds. Remove and whisk firmly to create a smooth icing. Now add the pure chocolate extract and whisk once again. Pour the chocolate icing in a ziploc bag and snip on one corner. (to drizzle the icing on the popsicles). Once the popsicles are frozen, take them out of the freezer and keep outside for a minute. Then gently remove the popsicle out of the mold. Keep the frozen popsicle on a plate or wire rack and drizzle the chocolate. Top with almonds and roasted quinoa. 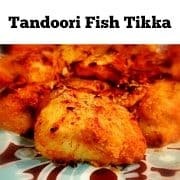 * The recipe takes 10 minutes to prep and make but needs 4-5 hrs to freeze. 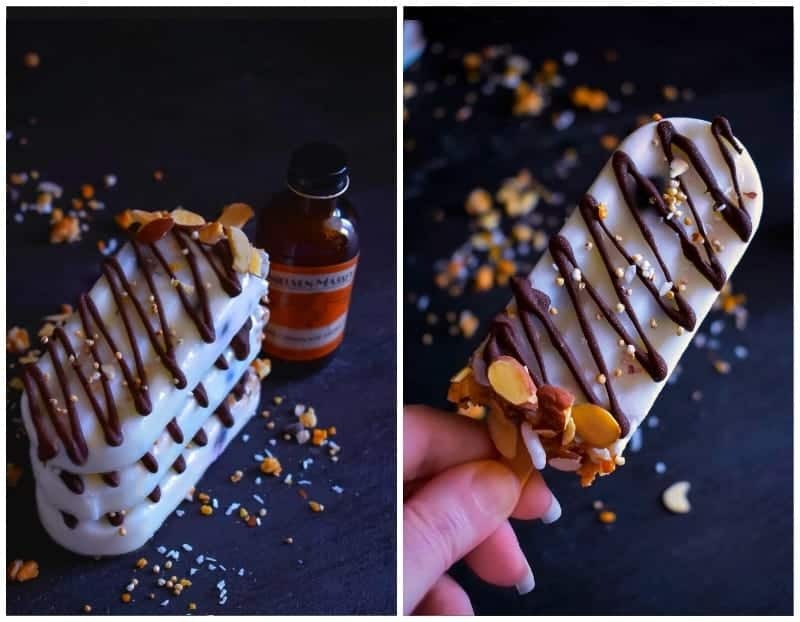 2 Replies to "Chocolate Yogurt Breakfast Popsicles (Vegan + GF)"